Eleven Atlanta educators were found guilty April 1, 2015, of falsifying documents and changing students’ exam answers to improve test scores. 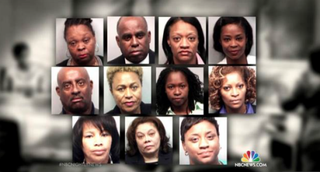 One of the biggest school cheating scandals in the country has come to a close with a Fulton County, Ga., judge handing out varying sentences to eight of 11 Atlanta school employees convicted in the case, Education Week reports. According to the report, Superior Court Judge Jerry Baxter showed some leniency toward those who took deals from prosecutors, taking responsibility for their parts in the ongoing scandal that some believe dates to 2001, CNN notes. A total of 35 educators were indicted on charges including racketeering and making false statements. Only 12 decided to take the case to trial. "I said to everybody, 'This is the time to search your soul,' " Baxter said during sentencing, according to Education Week. "Nobody has taken any responsibility that I can see. I was trying to give everybody one more chance. All I want from these people is for somebody to take responsibility." * Former school-reform-team executive directors Tamara Cotman, Sharon Davis-Williams and Michael Pitts got 20 years in prison each and are expected to serve seven in jail. They will get 13 years of probation and are expected to pay $25,000 in fines and contribute 2,000 hours of community service by tutoring inmates and students. * Former principal Dana Evans was sentenced to five years in prison and will serve one year in jail, plus four years on probation. She is expected to complete 1,000 hours doing community-service tutoring. * Former teacher Angela Williamson and former assistant principal Tabeeka Jordan were also given five years in prison to serve, two years behind bars and three years on probation, in addition to a $5,000 fine and 1,500 hours of community-service tutoring. * Former teacher Diane Buckner-Webb and former testing coordinator Theresia Copeland were each sentenced to five years in prison, serving one behind bars and four years on probation. They are also expected to pay a $1,000 fine and perform 1,000 hours of community-service tutoring. * Former teacher Pamela Cleveland will serve five years on probation and will be restricted for one year to home confinement between 7 p.m. and 7 a.m. Cleveland will also have a $1,000 fine and 1,000 hours of community-service tutoring of inmates and students. * Testing coordinator Donald Bullock also received five years' probation and will spend the weekends in jail for six months, plus do 1,500 hours of community-service tutoring. Another defendant was pregnant when she was convicted and will be sentenced later in August. Only one educator of the 12 was acquitted. "This is not a victimless crime that occurred," Baxter pointed out. "These kids were passed on and passed on. The only chance that they had was the school. There are victims in the jail, kids who I have sentenced." However, according to Education Week, Baxter did allow first-offender status for many of the officials, meaning that they will be able to clear their criminal records once their sentences have been completed. Read more at Education Week and CNN.